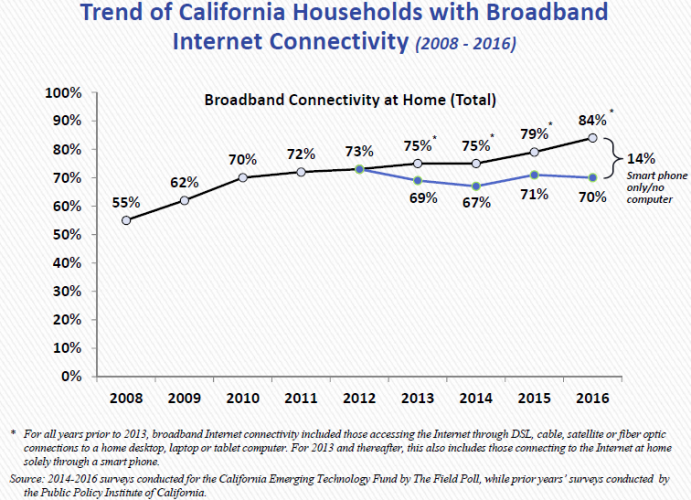 In California in 2016, the state that practically invented the Internet, 30% of Californians (nearly 12 million people) do not have meaningful broadband at home, according to an August 2016 survey by The Field Research Corporation. This article, part one of a two-part series, will look at the historical data on the Digital Divide and the new data from the recent Field Poll. This data will provide the context necessary to understand the problem and formulate appropriate public policy solutions. The graph to the left provides some historical context for California’s current Digital Divide. The overall broadband (i.e. high-speed internet) adoption rate has increased significantly since 2008, climbing from 55% in 2008 to 84% as of July 2016. However, that 84% is really illusory and doesn’t paint a full picture. California’s broadband adoption rate is at 84%, only if we include the 14% of people whose only access is on a smartphone. The California Emerging Technology Fund, which commissioned the survey, is technology neutral but recognizes differences in technological functionality. Smartphones do not have the necessary functionality to be an appropriate substitute for laptop or desktop computers. Because smartphones have small screens, small keyboards, and limited functionality on websites and applications, individuals who rely on them are considered “under-connected”—in other words, they are not able to fully compete in the digital economy. Because of the limitations inherent in smartphones, and because 14% of Californians are “smartphone only” users, it is more accurate and appropriate for policy makers to use the “meaningful” broadband adoption rate of 70%.